My mum makes excellent millionaire shortbread. It’s a treat when she comes to visit because I always get a tin full of lovely caramely chocolatey shortbread squares. On a daily basis I’ll come home from work and, hungry, peruse the fridge for something to eat. The tin of shortbread generally gets raided whilst I’m deciding what to make for my dinner…just one piece usually ends up being two or three; needless to say the millionaire shortbread supply never lasts long! 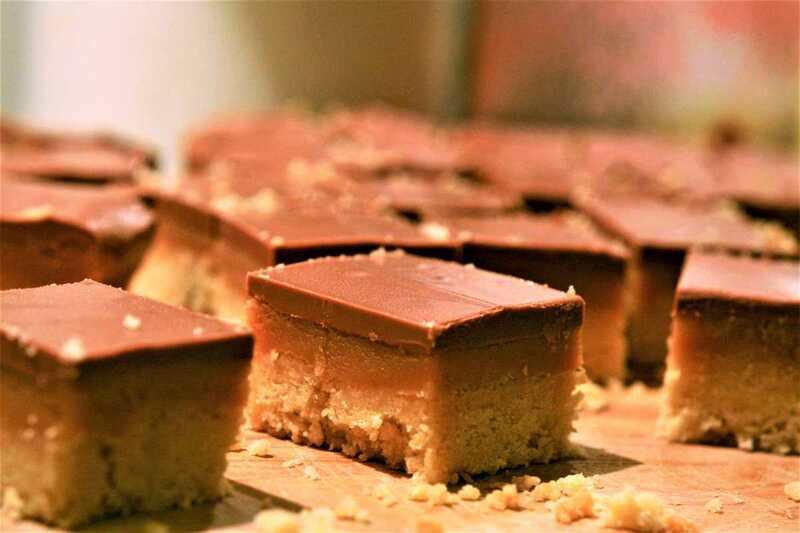 Since peanut butter and chocolate is already established as a good flavour combination it was just a small logical step to make peanut butter millionaire shortbread. I’ve been doing blog posts on Scottish ingredients and recipes, and shortbread is definitely a Scottish thing so I suppose at a stretch this is a Scottish recipe. On flicking through my recipe books, I picked up some tips on how to make shortbread. Although simple, it’s important to make it carefully so as not to end up with a poor result. When mixing the ingredients it’s vital to not overwork as the butter will begin to melt; then when it cooks it’ll be hard instead of the soft, melt-in-the-mouth consistency you’re looking for. Marcus Wareing suggests finely grating the chilled butter when making shortbread, then you hardly have to work the mixture with your hands and the butter barely softens at all. The result is excellent. First make the shortbread: in a large mixing bowl, place 270g flour, 80g caster sugar, a pinch of salt and 180g of chilled and finely grated unsalted butter. Lightly rub the mixture together with your hands until it resembles fine breadcrumbs. Line a 20cm x 30cm baking tray with greaseproof paper and press the shortbread mixture into it. Place in the fridge for about an hour. Preheat the oven to 160C and bake for 40mins or until light golden in colour. Remove from the oven, prick all over with a fork and leave on a rack to cool. When the shortbread is completely cool, make the peanut butter caramel: place 150g condensed milk, 40g unsalted butter, 50g of golden syrup and 150g of smooth peanut butter in a saucepan over a low heat and stir until melted and thoroughly incorporated. Simmer for 5 minutes whilst stirring constantly with a spatula; this thickens the caramel making it set firm when cooled. Pour onto the shortbread and spread evenly. Put in a cool place to set. To finish, melt 200g of milk or dark chocolate and pour over the caramel shortbread once it has cooled. Leave again to cool, then cut into squares.